If your teeth are worn or chipped, it’s natural to want to do something about it. Veneers are one option to give you that new, flawless, Hollywood smile. Veneers are a great option but they do come with a higher price tag. If your budget just won’t stretch quite that far, bonding is an alternative that can help save you some money. So, which option do you choose? In this article, we’ll discuss both so that you can make an informed decision about which option will work for you. Let’s start off with the least expensive option – dental bonding. This is also called cosmetic or composite bonding and it can produce really great results in a single session. If you have a minor flaw, like chipped teeth, gaps or edges that are worn, this could be a good option for you. The dentist will use dental composite to build up the areas that need it and reshape them as necessary. Dental composite is designed to match up with your teeth’s natural shade and is moldable until set, giving the dentist a fair amount of time to get the look exactly right. Once they have done so, the composite is exposed to a curing light to allow it to set. The dentist will check one last time once everything has cured and make adjustments as necessary. Veneers work slightly differently. The work out more expensive because they are made up of extremely thin porcelain or ceramic material that is laminated. 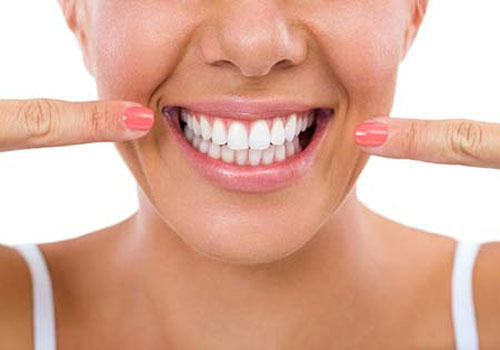 They are fitted to the front of your natural teeth and cover the whole front of the tooth. The advantage of veneers over standard bonding is that they create a much more dramatic finish. Whereas bonding relies more in the tooth’s natural color, veneers can transform it completely. There are any different veneer treatments and products to choose from so it will pay you to discuss your questions with your properly qualified cosmetic dentist before making your final decision. Which option you end up choosing will depend on the state of your natural teeth, and the extent of the transformation that you are aiming to achieve. The health of your teeth is best determined by your dentist, preferably a dentist who has experience in cosmetic dentistry. They will be able to recommend either veneers or bonding, depending on how much of a change needs to be made. They’ll also be able to run through all the relevant pros and cons for you.